Created in 1999, by Emile Heredia, Domaine de Montrieux has been fully immerse into Organic methods since the beginning . The plots were chosen for their qualities: age of the vines, soil quality and exposure. Priority was given to old vines, chastened, they allow good control yields. Their roots plunge deep into the ground, which confer them constant accessible moisture and better resistance to heat, and also ensure the minerality and intensity of the wines. Emile Heredia, a distant cousin of the famous Lopez de Heredia Family in Rioja, farms 7 hectares spread out between Villiers-sur-Loir and Naveil-Vendôme. These are some of the most distinguished slopes within the Anjou and Coteaux du Vendômois appellation, and which also encompasses some of the oldest vines of the area. One parcel of Pineau d’Aunis planted on its original roots in 1870 predates the arrival of phylloxera. Most vineyards are planted south-facing slopes overlooking on the Loire. The soil is composed of layers of flint stone and clays resting on a limestone bedrock. The AOC Coteaux du Vendômois red and rose wines (better known as "Gris") are produced from the Pineau d'Aunis grape, and the other red Table wine is a sparkling red, Cerdon du Bugey inspired, made from old vines Gamay. Traditional Chenin Blanc goes for the white. Pineau d'Aunis had its glory days during the Middle-Age, a favorite of Henry Plantagenet, wines made from this particular grape was first exported to England in the thirteenth century. At this time, it covered the entire Vendômois county and extended up until Nantes. Pineau d'Aunis, also known locally as Chenin Noir, is a red grape variety indigenous from the Loire Valley and predominantly planted in the Anjou and Touraine region. Rare in the US market are the wines made from 100% Pinot d'Aunis. In general, it is often blended with other grapes, like Arbois Blanc to produce Cheverny Rosé and Pinot Noir in the Côteaux du Vendômois. Crafted with organically grown 100% Pineau d'Aunis grape variety, manually harvested from pre-Phylloxera 140 years old vines, this natural, unfined and unfiltered wine is quite unique due to the age of the vines and interesting for its features. 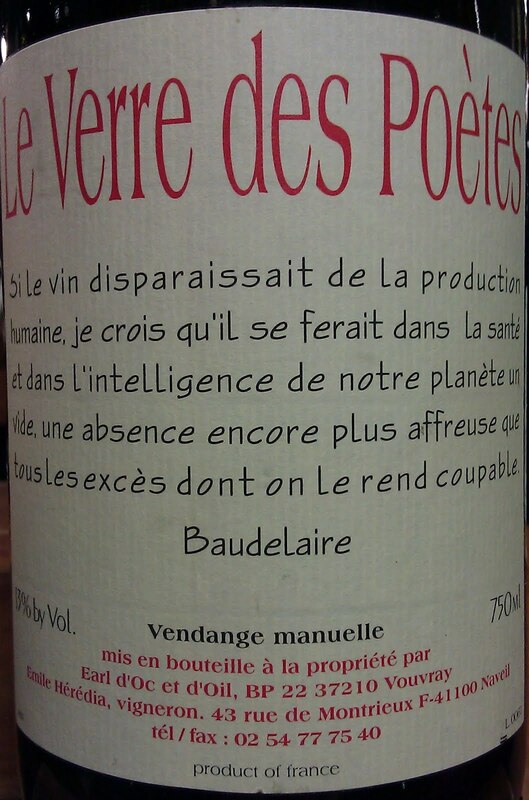 2008 Le Verre des Poètes, meaning "the Glass of the Poets", presents a cloudy, opaque ruby color. A touch green and raw, the nose boasts very inciting aromas of freshly harvested and crushed berry, cherry, raspberry and grape, mixed with herbaceous, slightly vegetal notes. The palate possesses strong soil oriented, earthy qualities. High acidity enhances the freshly crushed red and dark wild berries, framed by a lightly green, stemmy tannins. The finish is long and spicy, here again a touch vegetal, but nothing off putting, on the contrary. Overall, a very interesting wine to discover: bright, crisp, juicy, spicy, bit green, racy, fresh, natural and unusual, not necessarily rustic but definitely raw. Not for every palate and definitely food oriented, but a pleasing experience.